Hand Plunger Dispensers are designed for the easy application of pastes, gels, adhesives and fluids. 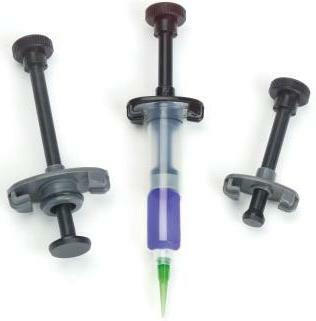 Attach a syringe barrel and use these dispensers to control fluid deposits. Hand plungers are low cost solutions and ideal for low volume applications, repair or re-work or areas where an air supply is not available. A portable and lightweight manual hand syringe applicator for applying most pastes, gels, fluxes, adhesives and greases. Works with our 3cc, 5cc, 10cc and 30cc industrial grade barrels and wiper pistons. When a small spot of grease is required to a motor assembly, or for repair work, prototypes, etc - the HP dispenser is ideal. Simple barrel attachment and comfortable in the hand. Designed for fluid viscosities ranging from water to lard with barrel sizes suitable for small dot to medium volumes. Applying pressure to the manual plunger allows you to control the dispense volume. Basic reusable plunger comes with a single barrel, piston, tip cap and a dispense tip. Also available as full kits that contain stocks of barrels, pistons, tip caps, end caps and assorted dispense tips. 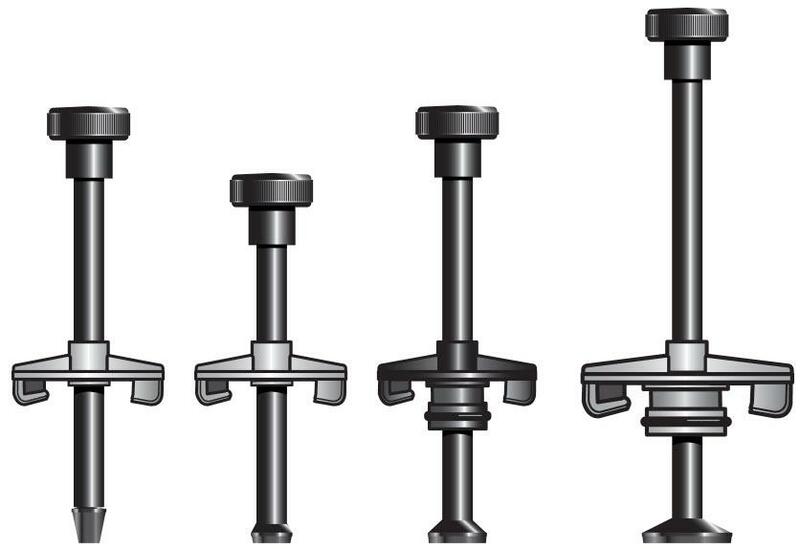 All plungers ship direct from stock and include basic instructions for use. Take a syringe barrel. Attach a luer lock tip kit. Place the material into the syringe barrel to around 3/4 full. Insert a plastic wiper piston and push down to material level. Attach to the hand plunger device. Remove tip cap and attach a dispensing tip. Touch tip to substrate and gently press the plunger for material flow. When finished, remove the tip and attach tip cap to seal. Reusable Syringe Barrel Hand Plunger Dispensers. Supplied ready to use in sealed packs with labels and batch codes. Select either plunger rod only or with component kits. All items ship within 24 Hours. The rods are robust and handle most liquids and pastes dispensed from them. O-rings can become worn or covered in glue so they are available to order from stock as replacements. The rod is supplied with (1) spare rubber O-ring in the pack. For future replacements, select the 30/55cc size in EPR or Viton. Please contact us if replacement rods are required. General Use: Plungers are portable and can be used in a factory production or assembly department as well as for repair and re-work. Plungers are commonly used in the field for repair or maintenance applications. Common Applications:- Dots and beads of solder paste, Dots and beads of solder flux, Grease to bearings, PVA glue to furniture joints, RTV to seal seams, Silicone dots to bond products, Gasket sealant repair, Shots of roach insecticides, General adhesive applications.